The first round of Mixed Match Challenge continued in Kansas City, Missouri this week, as RAW's Goldust & Mandy Rose faced of with SmackDown's Naomi & Jimmy Uso. But how did it all go down? Let's have a look. 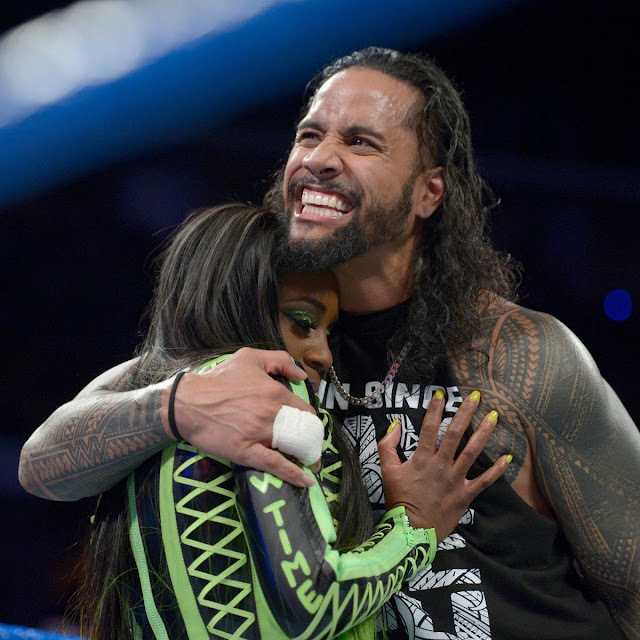 Naomi & Jimmy Uso became the first SmackDown tandem to make it through to the Quarter Finals of Mixed Match Challenge, as they picked up a victory over Goldust & Mandy Rose, after Goldust received the Rear View from Naomi and a Superfly Splash from Uso. Whilst hardly a wrestling classic, I found myself thoroughly enjoying this easy watch of a match, that pushed the comedy elements of the character, with Uso in particular getting a chance for creative, clearly enjoying himself in there with the veteran of laughs, Goldust. This was helped by a crowd who were happy to play along with the jokes, mostly regarding Goldust being unable to keep up with Jimmy. The wrestling that there was solid stuff and featured a fun sequence where both teams hit signature moves in tandem and a solid near fall for Goldie off a sloppy Final Cut. 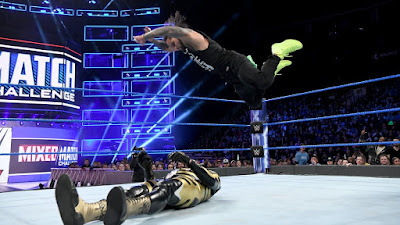 The highlight of the match was Rose hiding behind the Bizarre One on the outside to avoid Naomi, only for the former SmackDown Women's Champion to slingshot right over Goldust's head and flatten Rose anyway. The most off-putting part of the presentation was having Michael Cole tell us what Rusev and Lana were saying in the Facebook comments section on the feed, because surely the point is that if you're interested in what they're saying you'll be reading the comments. The Bulgarian Brute and the Ravishing Russian actually came out after the match, claiming to be the strongest husband and wife team and getting the crowd to sing a cute little song ahead of their First Round match with Bayley & Elias next week. Naomi & Uso will return to face Alexa Bliss & Braun Strowman in the Quarter Finals in four weeks. - Elias and Bayley cut a promo on next week's match with Elias not letting Bayley sing along and also refusing a hug.